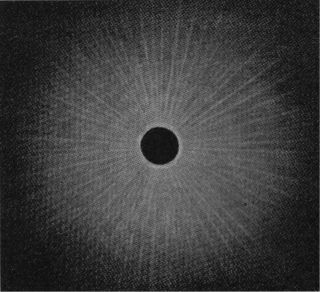 A sketch by Spanish astronomer José Joaquin de Ferrer shows the sun's corona extending outward during a total solar eclipse June 16, 1806. It seems that everyone is eagerly awaiting the shady drama that will be enacted in the skies over North America on Aug. 21. It is a play whose script was written eons ago: On that third Monday in August, the celestial wanderings of the sun, Earth and moon will cause our natural satellite to pass directly in front of the sun, resulting in a total eclipse on Aug. 21. The narrow band of totality, averaging some 70 miles (113 kilometers) wide and stretching about 2,500 miles (4,023 km) from the Pacific coast of Oregon to the Atlantic coast of South Carolina, will provide a spectacle that has not been seen from any part of the contiguous United States in nearly 40 years. On Aug. 31, 1932, the New York Times ran a headline stating that a total solar eclipse that was to sweep across New England that day would be the last "really good" eclipse for the United States (from a logistical standpoint) until 2017. "It thus appears that after our eclipse of 1932 has passed into memory there will not be an opportunity to view a total eclipse of the sun from the continent of the United States, under conditions that are really favorable and promise scientific success until August 21, 2017; 85 years hence." On March 7, 1970, during a telecast of a solar eclipse from Valdosta, Georgia, over the CBS Television Network, the late Charles Kuralt asked Kenneth Franklin of New York's Hayden Planetarium about the next total eclipse that would be accessible to folks "down South." Franklin then mentioned an eclipse that was still far in future: "The next eclipse that will pass across this nation and go out along the Carolinas will be in the year 2017." Noted Kuralt: "That's a pretty long time (47 years) to wait." "Well," countered Franklin, "unfortunately, that's the way of the world." It's difficult to say exactly when most people started counting down to this upcoming eclipse, but you might say that we could start an "official" or "final" countdown this weekend — on Sunday (July 23) at 5:46 a.m. EDT. That will be the moment of the new moon, and it will also be the last new moon before next month's solar eclipse. The interval from one new moon to the next is referred to as a "synodic" month, derived from the Late Latin word synodus, which means "meeting." For indeed, at new moon, the moon "meets" the sun. Next month, when the moon comes around to the sun's position once again, it will be near a point in space (called a "node"), where the moon can cross paths with the sun as seen from our earthly perspective, producing an eclipse of the sun. Or as astronomer Leslie Peltier noted in his popular autobiography, "Starlight Nights" (Harper & Row, 1965): "Only during an eclipse of the sun can we note the instant when the old moon, moving eastward, crosses the median line of the sun and becomes a fresh new moon just starting out on another monthly lifetime." But wait a minute. That next new moon will come on Aug. 21 at 2:30 p.m. EDT. That's almost 29.5 days after this Sunday's new moon. But it takes only 27.3 days for the moon to make one revolution around the Earth. So where did the extra 2.2 days come from? It may surprise you that there is more than one type of lunar months. In addition to the synodic month, there is also the sidereal month. If we were to align the position of the moon with a particular fixed star in the sky, it would take the moon about 27.3 days to return to a position where the moon is once again aligned with that star. And the moon will have also made one complete circuit in its orbit around the Earth in that same interval. But if we note when the moon is most closely aligned with the sun, and then follow the moon for 27.3 days until it reaches that exact point in the sky again, the sun would no longer be there. And that's why even though it takes the moon just over 27 days to circle our Earth, it takes just over two additional days to go from one new moon to the next. Meanwhile, remember the day this weekend (Sunday) and the time (5:46 a.m. EDT) marking the moment of the July new moon. When the moon cycles around the sky and turns new again one synodic month from now, on Aug. 21, the long-awaited "Great American Eclipse" will finally take place.